Old Urbanist: Narrow Streets and NYC: The Problem, or the Solution? Narrow Streets and NYC: The Problem, or the Solution? After an earlier post on the spaces in between blocks, I'd like to circle back to consider one of the enduring oddities of New York's particular history with streets, apartments, and the spaces behind them: that being, that the harder the city tried to banish narrow streets, or, more specifically, narrow spaces between buildings, the more they seemd to proliferate. I've mentioned before that a primary reason that the New York state legislature mandated streets of no less than 50 feet for the city's 1811 plan, and barred the opening of new streets without its consent, was, according to surveyor John Randel Jr., to "[avoid] the frequent error of laying out short, narrow, and crooked streets, with alleys and courts, endangering extensive conflagrations, confined air, unclean streets, &c."
Randel's remarks indicate that he was not only concerned with streets, but with courtyards and other non-street spaces that happened to be narrow or enclosed. 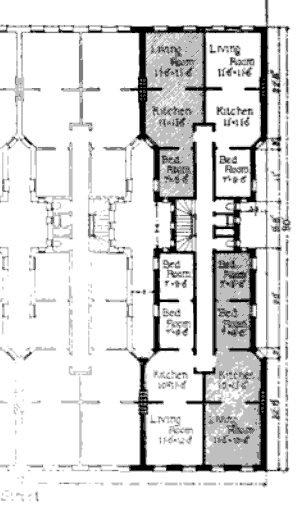 Through a long series of unintended and unforeseen consequences, which I won't repeat here, the result of this focus on avoiding narrow "alleys and courts" was the familiar New York tenement, seen at right in its mid-block "dumbbell" form (source here), in which only one in seven of the rooms opened onto the wide fronting street. The remainder opened onto a tiny airshaft or looked out over a 10-20' gap between tenements. Put another way, 11% of the building perimeter faced the street, another 11% faced the rear court, while 78% faced interior light shafts. Again, the city appears to have avoided the opening of any dreaded narrow streets, but if we consider this arrangement of structures closely, it is possible to see how the majority of rooms (around 70%) open onto spaces ranging from 10' to 24' wide – very much within the range Nathan Lewis has defined for his "really narrow streets." (Confirm on Google Earth if you'd like.) The network of courts and air shafts even resembles a street network, but no attempt has been made to use it or adapt it for that purpose. With the new law tenements, New York had come full circle after nearly a century. The desire to eliminate courts and narrow streets, without an understanding for the reason they had come into being again and again in the traditional cities of the world, had led, unintentionally, to pre-law tenements, old law tenements and at last to the new, where narrow streets, courts and alleys – the very things which the initial 1811 plan had sought to abolish – were effectively re-introduced as the central design feature. By employing this semi-traditional format of mid-rise apartments on very narrow courts and alleys, and without dedicated parking, but with hypertrophic, automobile-scaled streets, areas built according to "new law" regulations achieved extraordinary densities. Inwood and Washington Heights, built almost entirely along these lines, have an average density of 130,000 per square mile with very few buildings over six stories. To put this in perspective, only two other American cities (as of 1990) in the have even one census tract greater than the average density of these neighborhoods. The failure to let the alleys serve as public rights-of-way, however, saps the vitality of these places by inflating block dimensions and impairing connectivity, while the omnipresent wide automobile thoroughfares detract from the pedestrian experience, as they do elsewhere in the city. The presence of a few parks is offset by the complete absence of public squares. A traditional city format, by contrast, addresses these shortcomings while permitting the same intensity of development. The heyday of the new law tenement was brief, lasting only though the 1920s, after which the ascendant tower-in-the-park design philosophy dispensed with urbanism altogether in a single-minded pursuit of open space, light and air. Still, the fact that, despite a century's worth of effort against them, courtyards and narrow ways returned as the solution to New York's early 20th century housing problems serves as one illustration of the enduring functional virtues of narrow streets. I love the odd courtyards of upper Manhattan. I am a realtor and any chance I get to pop through one I take it. It's so "New York" but at the same time I feel transported to a bustling old world city full of the back streets the NYC grid tried to eliminate. I imagine small parks, shops, entire lives lived in these second cities behind the streets. This is actually how many streets in Philadelphia came to be as they were once alleys that developed. Indeed. Philadelphia historically embraced converting alleys into streets, and the high intensity of this subdivision is a key part of what makes it only a handful of American cities which exude Old World charm. Perhaps the avenues in Manhattan could be trimmed 10-20 feet, but I'm very skeptical about the idea that the city would be better off with much narrower streets, even if you made more of them. The proportions feel about right even with 4-floor row-houses and they're even better with six story structures. Plus, even at current width, they're often down to one functional lane. All the places you point out with streets half that wide may have more charm than Manhattan, but most of them feel like museums, not places were people actually live functionally today, largely because the streets are way too narrow to all the volume of traffic that modern life requires. That said, I would be all for adding narrow streets to Manhattan by punching two extra pedestrian streets between all of the avenues. 910 feet is way too far between roads. That's the real problem with the grid. Thanks, as usual, for all the interesting links! By the way, as someone who is NOT a fan of narrow streets (although I think a few here and there can be OK), in my opinion the legislature made a pretty good decision banning new narrow streets; however, I think they made a bad decision also apparently banning additional "wide" streets (either straight or crooked). If someone wanted to give the city a new "wide" street (as part of a land development scheme), I say, "more power to them!" Also, not that you would likely have this information handy, but I'm also wondering how difficult it was to gain the permission of the state legislature and / or when this law was lifted or amended since, at least many years later, Manhattan did, apparently, acquire some added "streets"). Mon. Feb. 6, 2012, 9:25 p.m.
Reducing the proportion of space devoted to high-speed automobile circulation is, to me, a more pressing concern than actually narrowing the right of way by extending building footprints. I would respectfully disagree, however, that streets narrower than 60 feet are insufficient for modern traffic needs. As Nathan Lewis has pointed out, Tokyo (as well as hundreds of other Japanese cities) function very well with most streets far narrower than that. The explicit goal here is making travel by car inconvenient relative to travel by foot, bicycle, or mass transit. With specific regard to this post, I was suggesting, somewhat indirectly, that narrow streets have a certain unavoidable spatial logic apart from their effect on transportation or quality of life. I've hinted at it in other posts, as well, but it might be worth a new one to really clarify in a more rigorous way the relationships at work here. The relevant section is on page 275: "And no square of plot of ground made by the intersections of any streets to be laid out by the said Commissioners, shall ever, after the street around the same shall be opened, be, or remain divided by any public or open lane, alley, street or thoroughfare." This meant, effectively, that anyone seeking to open a new street needed to obtain permission from Albany to do so, as was the case for both Madison and Lexington Avenues. "No authority short of the legislature can now alter or defeat the plan established by the commissioners, and permanence is strongly inscribed on what they have done." If you make streets that are half as wide, but twice as plentiful, then you can have one parking lane and one travel lane, and have the same total amount of parking, especially if you add in extra "half-avenue" streets. And as far as what level of traffic modern life "requires", keep in mind that, if driving and parking are cheap enough, traffic tends to expand to fill the space available to it. There's some basic level needed for freight distribution, and transportation for those who can't walk or use rapid transit, but that's not what most traffic in Manhattan is for. @Anonymous: I agree. Currently, in these "new law" districts, there are 60-foot E-W streets and 24-foot E-W alleys, not open to the public, between apartments (the result of mandatory 12-foot setback laws). The alleys are a dead space, serving no purpose except to provide light to interior windows, and consequently are treated poorly by the residents. If, instead, you had two 30-foot streets the amount of usable street area would remain the same while you'd gain 24 feet of buildable area. Six story buildings on 30-foot streets can work just fine, especially if the top floor employs a mansard roof. 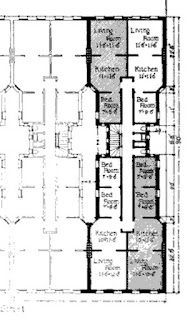 Ultimately, I think the 200' block width is too large, also, since the typical wing of an apartment building cannot be much wider than 60' in order to admit sufficient light to interior rooms, suggesting an ideal width of roughly (60*2 + X), where X represents the width of an enclosed courtyard between the apartments. @Marc: yeah, that's a good one too. Many of the other proposals are "green" fantasies, but Massengale's (it looks like he contributed three) are all terrific, all unapologetically urban. Fascinating! I hope you won't find this to be too off-topic -- last night I watched a documentary about raccoons in cities. For me, the highlight was a satellite view of Toronto with color-coded paths showing the scope of each raccoon's territory. It very much reminded me of Kevin Lynch's The Image of the City, raccoon-style. After tracking each raccoon, it was discovered that the average territory is only about 3 blocks, and that the boundaries are, without fail, the larger streets [and also parks, because they don't offer the shelter and tasty garbage that homes, backyards and garages do]. Raccoons travel using alleys and side streets, because cars are really their only urban predator. It's so interesting to me to overlay all that information onto the examination of alleys and courtyards as they pertain to humans. I would say that the pattern of "alleys and courtyards" actually IS a street network, much like you'd see in Bangkok or Tokyo. One thing you find in Tokyo and other such places, especially in Asia which did not adopt the European "solid wall of apartments" look so much but has a lot more freestanding buildings, is that there is a continuation of streets/passageways down to as narrow as three feet. Streets don't have names in Tokyo for this reason -- it would be silly to give a name to a pedestrian passage that's five feet wide and twenty feet long. Plus, the sheer number of such streets is so much greater that the whole "streets with names and addresses with street numbers" system basically becomes impractical. Instead, a system of blocks is used, and then building numbers within the blocks. Only large avenues have names. The blocks can have many small streets within them. No streets or street numbers. The U.S. pattern of giving streets names, and then relegating smaller streets to some sort of subclass of "alleys," is itself a reflection of the 19th Century Hypertrophic layout. By the way, the "dendritic" format (many dead-end streets) is a perfectly good one. Many, many suburbs have been laid out this way -- the typical cul-de-sac -- and you'll find many examples in Traditional Cities around the world as well. This example of "new law" apartments seems pretty nice to me. If anything, I'd just make the block a lot bigger, like 3x wider and longer. This sort of thinking presents a mental obstacle to an understanding of the role and function of narrow streets in traditional urbanism, since as you say it more or less automatically relegates all narrow streets to second-class status. The information on Tokyo is fascinating. With a fractal-like division of blocks by narrow streets and passages I can see how a street naming system would quickly break down. Yes, the mentality that alleys are only suitable as utilitarian service corridors needs to be overcome. There are a handful of historical examples - Philadelphia and Baltimore mainly - where this 'alleys as service corridors' mentality slackened and alleys were used as service corridors AND as full residential+commercial lanes in their own right. Many other cities once had laneway/alley houses too (these were uniformly outlawed after WWII). But there is a *huge* difference between the dendritic suburban cul-de-sac format and the dead-end narrow streets of prewar European towns and cities. I don't know what the dead-end urban streets of Asia are like, but I've found that the "dead end" streets of old European cities are not truly "dead end" in the literal sense of the word. Yes, the physical cobblestone or brick pathway may end abruptly, but there often is a portal, loggia, passage, stairway, or niche through which walkers can pass through the wall of buildings to the street/plaza on the other side. The scooters, cars, bikes, and motorcycles may have to turn around and head back, but the walkers can always move on. So many of these "dead end" streets are not really dead ends. It's true that some of the earliest suburban cul-de-sac developments attempted to incorporate the same design features: the auto carriageway would abruptly end, but the sidewalks would continue on as pedestrian walkways and connect to the next maze of dendritic streets. But the modern suburb rarely attempts to incorporate these design features anymore: sidewalks are eliminated and berms, fences, or private yards completely cut off all vehicular AND non-vehicular movement between cul-de-sacs. This is not true of many old European dead-end streets, which is why I think the contemporary cul-de-sac is an overtly anti-urban feature. @Marc: that is very true -- I remember instances of those sorts of passages throughout Siena. The grain of the streets ran finer and finer, until it dissolved in hidden stairways and covered passages four or five feet wide. Apparently this was not by accident, but due to medieval-era laws requiring the appropriation (with compensation) of a right of way in certain places to provide for optimal connectivity. When the acquired ROW is only five feet wide, and the air rights are preserved for the owner, the purchase won't require a bond issue. "Reducing the proportion of space devoted to high-speed automobile circulation is, to me, a more pressing concern... The explicit goal here is making travel by car inconvenient relative to travel by foot, bicycle, or mass transit." If you really think one of the major problems with Manhattan is that cars move too quickly and too easily through the place, discouraging the use of foot and mass transit — or if you think that people on bikes is a much better alternative for pedestrians than people in cars — I'm inclined toward vigorous disagreement. I'd really like to see your argument that speedy traffic movement is making life bad for New Yorkers and that making vehicular traffic flow much worse -- rather than making moves that would improve life for walkers or mass transit -- would create any benefits beyond perhaps less noise and fewer traffic fatalities. I'm not one who puts the convenience of cars above all other things. Far from it. When the needs of drivers and walkers clash, I'm generally on the side of walkers. But hobbling one form of transportation, any form of transportation, not as a means of improving other forms of transport but simply for the sake of making transportation harder seems crazy. Or am I misunderstanding your argument? Also, I'm not sure I'd point out Japan as a counter-example. I don't know anyone who is not from Japan who longs to live in any Japanese city. Nothing I've seen there even remotely approaches a world class urban environment (which is probably not the fault of street width) and life there seems very inconvenient in terms of getting around (which could actually be the fault of insufficient roads). @Andrew: Regarding "I'd really like to see your argument that speedy traffic movement is making life bad for New Yorkers and that making vehicular traffic flow much worse -- rather than making moves that would improve life for walkers or mass transit -- would create any benefits beyond perhaps less noise and fewer traffic fatalities." First, speedy traffic movement really shouldn't be a major concern for New Yorkers given that only 23 percent of Manhattan residents (and a minority of all New Yorkers) even own a car. Certainly taxis are used by most, or all, city residents, but a plan to optimize taxi movement and efficiency at the expense of other concerns (even if that were a sound idea) probably wouldn't look much like what New York has now. My comment was directed toward changing the existing balance of space between car users and those on foot, where in some cases cars command 80 percent of the street area despite carrying a fraction of the total transit volume (subways + pedestrians + bicyclists). The benefits would potentially be immense -- consider that only around 3 percent of New York restaurants currently have outdoor patio seating, due in large part to the inadequacy of sidewalk width and the noise and fumes from traffic. Licensing the ROW to restaurants could provide a robust new income stream for the city while greatly enhancing street life and encouraging walking (which in turn boosts retail sales). All this in turn would increase property values and desirability. And what are the costs to reducing the number of traffic lanes in the city? If it discourages driving, on the margins, is that a bad thing? In combination with gas taxes and tolls, or a general system of congestion pricing, it is possible, or likely, that traffic flow might actually improve, with the remaining users being those who truly have need for auto transport. "And what are the costs to reducing the number of traffic lanes in the city?" In places with no traffic congestion, there's no cost. In places where traffic is already tight, which is most of Manhattan, it would decrease the speed of traffic. 3. Make getting places in cabs slower, which would not be a daily problem for NYers like me who are too poor to take cabs all the time but it would still be a huge problem because when I take a cab, it's generally because I really, really need to get someplace reasonably fast. 4. Lead to a lot of ambulances, fire trucks and police sitting in even more congestion than they do now. 5. Overcrowd subways that are at capacity in prime rush hours (though obviously this would only be a concern on some lines for a few hours a week, but would still be a reasonably big deal because they are the lines/times that people use most). Other than that, I don't see any real costs. I'd still consider narrowing streets in places where the sidewalks are often too congested to move freely because those sidewalks are clearly handling huge numbers of people. But this is a really high price to pay for a little more peace and quiet and some al fresco dining (particularly given our questionable climate). If you want to get rid of noise and fumes, wait ten years and enjoy the electric cars. No fumes, utterly silent (unless idiot legislators force them to make noise, which they probably will). @Marc: narrow street enthusiasts? Where'd you get the idea that anyone on this site supports that crazy idea? I do remember Roslyn Place from Great Streets, although I wasn't aware, until reading the article you linked, than Jacobs himself lived on it. Perhaps a bit of hometown favoritism, then, but it was (and still appears to be) a very appealing setting, yet a model for residential living that ultimately did not really catch on in the United States.